Warren knows that if she takes large donations, she’ll be pilloried by progressives. The finance director isn’t stupid–he knows large donations are politically damaging. He’s been with Warren for a long-time, and knows her strategy well. So why did he advise her to take big donations anyway? The short answer is that the Warren campaign is really struggling to raise any money. She was only able to raise $299,000 on the first day of her candidacy, compared to $5.9 million for Sanders. Warren has transferred $10 million from her senate war chest to keep herself in the race. But in just six weeks, Sanders already has $18.2 million. Even Kamala Harris has $12 million. There isn’t enough money in that senate war chest to keep Warren competitive for very long. She needs more money. But Warren knows she can’t take those big donations–she’s running as a progressive. So how can she keep going? The only way to continue is to get grassroots donors to start helping her, and the only way to get grassroots donors to start helping her is to come out for exciting, zany things. Exciting policies get media attention. If you can’t fund ads, you can at least get the press talking. The thing is, because the Warren campaign is fighting for its life, it is taking positions it knows it would never deliver. The president doesn’t have the power to unilaterally “abolish the electoral college”, because it’s part of the constitution. Reparations polls terribly with general election voters. Most congressional Democrats don’t support Warren’s corporate reforms, tax policies, or tech trust-busting, and if Warren can’t raise enough money for her own campaign, how is she meant to raise enough money to help progressive primary challengers take on the centrists within the party? You can agree with Warren, damaging your general election prospects to defend your primary position. You can disagree with Warren, damaging your primary position to preserve your general election prospects. You can be vague and unsatisfying, splitting the difference between #1 and #2. I think what we have got to do is pay attention to distressed communities: black communities, Latino communities, and white communities, and as president, I pledge to do that…I think that right now, our job is to address the crises facing the American people and our communities, and I think there are better ways to do that than just writing out a check. There needs to be a study, but let me also say this, that I think that what we need to do … is to pay real attention to the most distressed communities in America…We have got to use 10 percent of all federal funds to make sure that kids who need it get the education, get the jobs, get the environmental protection that they need. And that would be a major focus of my efforts. This is the whole goal–there are only so many grassroots donors out there. For Elizabeth Warren to get some, she has to take them from someone else. Warren wishes to stay in the race at Sanders’ expense, quite literally. This is why I have so little tolerance for uncompetitive quasi-progressive candidates who raise small amounts of money, receive small amounts of support in polling, but nonetheless persist in attempting to divert resources from Sanders, the only left candidate who polls competitively or is likely to poll competitively. It’s really easy to identify this–if someone low in the polls with a weak fundraising position starts throwing out red meat policy whitepapers to rally base voters, they are acting out of desperation. A candidate who is desperate will say anything to stay in and will make all kinds of promises they not only cannot keep, but in many cases have no intention of keeping. She’s about as likeable as Amy Klobuchar (74.3%), and that’s not saying much. 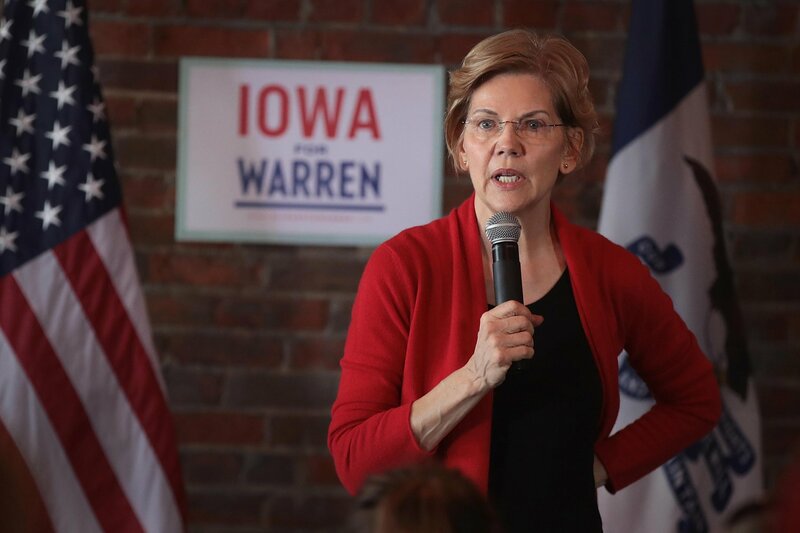 Warren isn’t going to win, but she will inflict maximum damage on Sanders while she figures that out, benefiting straightforwardly centrist candidates like Biden and O’Rourke along the way.